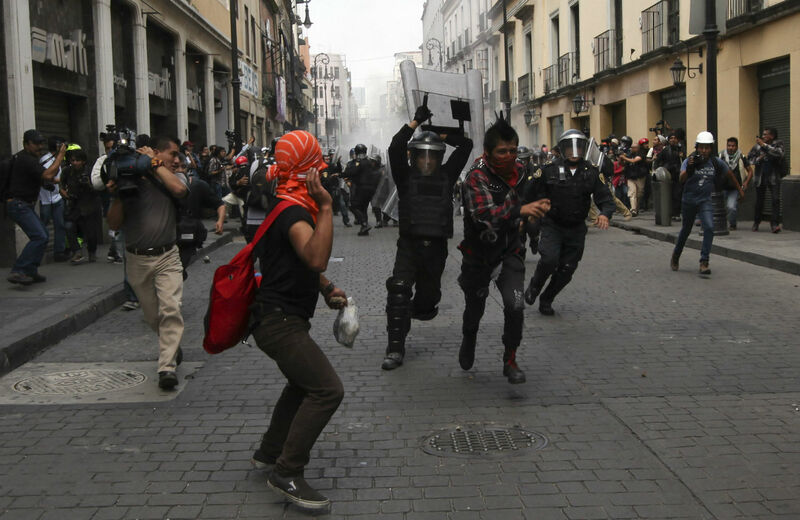 Enrique Peña Nieto is using violence and repression to dismantle his country’s progressive legacy. President Barack Obama has not only failed to achieve comprehensive immigration reform, but he has also actively participated in the dismantling of development and democracy in Mexico, the homeland for two-thirds of US Latinos. Obama’s policy toward Mexico builds on the long tradition of US support for neoliberal authoritarian regimes in Latin America. Just as Washington actively encouraged military coups in South America during the 1970s and armed the dictators of Central America during the 1980s, today it props up Mexico’s corrupt political class as it slowly tears the country apart. John Kerry’s trip to Mexico City this week was supposedly for the purpose of consolidating a “North American and global partnership.” But this new relationship will be doomed from the start if the Obama administration does not break with its ideological foreign policy approach, which privileges the demands of Wall Street and the Pentagon over the needs of common citizens on both sides of the Rio Grande. Mexico’s new President Enrique Peña Nieto plays the same role in Latin America today that the Chilean dictator Augusto Pinochet did in the 1970s. The Financial Times has hailed Peña as the man who supposedly will be able to stop the advance of South American “populism,” on display in Venezuela, Ecuador, Argentina, Uruguay and Bolivia, and bring back the “Washington Consensus” as the dominant ideology in the region. Indeed, Peña’s central objective since taking power on December 1, 2012, has been to completely dismantle the progressive legacy of the Mexican Revolution of 1910. He has drastically rolled back protections for labor, imposed neoliberal education reforms and moved to hand over the enormous oil and gas industry to transnational petroleum companies. He has also turned Mexico into a servile client of US foreign policy and “national security” concerns. Peña has relied on violence, repression and censorship in order to impose these policies on a recalcitrant public. Human rights violations and attacks on the press have skyrocketed under the new administration, according to recent reports by Article 19, Amnesty International and a leading network of local NGOs. Since Peña’s inaugural seventeen months ago, protests and marches have typically met with violent repression and arbitrary arrests. An important community organizer who participated peacefully in the inaugural protests, Juan Francisco Kuykendall, recently passed away due to the wounds he received when a police tear gas canister or rubber bullet struck his head during the rally. A leader of community policing initiatives in the state of Guerrero, Nestora Salgado, is today in jail for supposedly “disturbing the peace” by putting into question the integrity of corrupt officials. A Greenpeace activist is being aggressively prosecuted by the Peña administration for allegedly damaging a light on the building from which she hung a protest banner in the state of Veracruz. This month, a distinguished leader of indigenous communities in Chiapas linked to the Zapatista National Liberation Army (EZLN) was brutally killed by members of a paramilitary group historically linked to Peña’s Party of the Institutional Revolution (PRI). Meanwhile, Peña has faithfully followed instructions from Washington to continue with the disastrous militarized “kingpin” drug war strategy, based on taking out leading narcotraffickers without attending to the root social and economic causes of the problem. The result has been a continuation of the bloodbath initiated under the previous president, Felipe Calderón, who governed from 2006 until 2012. During 2013, Peña’s first year in power, there were more than 18,000 violent killings and more than 2,500 kidnappings. Peña has also turned his back on the rest of Latin America and embraced Washington’s regional power politics. The Mexican president barely lifted an eyebrow in response to the revelations about indiscriminate US spying on Mexico, Brazil and other Latin American nations. He also refused to join forces with the South American governments in their condemnation of the forced landing last year of Bolivian President Evo Morales’s plane on the suspicion that it might have Edward Snowden on board. Meanwhile, Peña has permitted the indiscriminate and illegal use of US military drones over Mexican airspace, most notably in the recent capture of the capo Joaquín “El Chapo” Guzmán. The US press has generally applauded Peña’s policies. The Washington Post argued in a recent editorial that “as Venezuela’s economy implodes and Brazil’s growth stalls, Mexico is becoming the Latin oil producer to watch—and a model of how democracy can serve a developing country.” Both Time and Rolling Stone have recently published glowing cover stories in their international editions about the new Mexican president. Obama has followed suit. In his keynote address at Mexico’s National Anthropology Museum a year ago, the US president used langauge that appeared to have been ripped out of Peña’s inaugural address. Obama’s insistence on the need to “discard old habits that are no longer working” and “old attitudes that stifle progress” directly mirrored Peña’s declarations that “it is time, together, to break the myths and paradigms that have limited our development.” This sounds innocent enough at first glance, but what it actually means in local parlance is that it is time to dismantle the last vestiges of Mexico’s welfare state and open up the floodgates to predatory, unregulated international financial markets, especially in the oil and gas sectors. Imagine for a moment what the US public would think if the president of Mexico were to call for the end of Social Security and the privatization of the National Park Service in a keynote address at the Kennedy Center. Obama’s rhetoric, and more importantly his actions, have been equally imprudent. For instance, last December the Obama administration ordered the website host Go Daddy to close down a leading Mexican Internet protest and human rights site in response to a groundless complaint from the Mexican government. In general, the US Congress has appropriated over $2 billion in law enforcement and military support to Mexico since 2008. A great deal is at stake in the battle for Mexico. In addition to being the place of origin for at least 33 million US residents, Mexico is the eleventh-most-populated and has the fourteenth-largest economy in the world. Even more important, Mexico has long stood out for its distinguished constitutional tradition of protection of fundamental social and economic rights and has been an important international champion of national self-determination. The Mexican Constitution of 1917, a product of the radical, peasant-led social revolution of 1910, is revered by comparative constitutional law scholars as the first Constitution in the world to formally grant citizens a wide array of social and economic rights, including the right to work, education, land and healthcare. Indeed, with the fall of the Berlin Wall and the end of “really existing socialism” in the Eastern bloc, Mexico’s non-ideological eclectic approach to the synthesis of social welfare, liberal rights and national development is today particularly well poised to set an international example. Mexico has also historically played a crucial role as an independent voice in international affairs. Its commitment to political asylum throughout the twentieth century turned it into the destination of choice for leading progressive intellectuals and politicians, including Leon Trotsky and thousands of Spanish Republicans during the Spanish Civil War as well as Argentines, Chileans and others fleeing dictatorship in later decades. Mexico has always maintained close diplomatic ties with Communist Cuba and has consistently resisted US bullying to support overseas imperialist adventures. In 2003, while serving as a member of the UN Security Council, Mexico bravely stood up to George W. Bush and refused to support the US invasion of Iraq. But Peña wants to throw this distinguished constitutional tradition into the dustbin of history. If he succeeds, not only will Mexicans suffer but global politics and humanity in general will lose out as well. Fortunately, those concerned with the plight of Mexico can count on a powerful ally: the Mexican people. After only seventeen months in power, Peña is now the most disliked president in modern Mexican history. Polls show that only thirty-seven percent of the population approves of his performance, and only a minority supports his neoliberal policies. One would be hard pressed to find a single case of a Mexican president more rejected by his own people over the more than two decades in which presidential approval polls have been conducted in the country. It is only a question of time before this discontent bubbles to the surface and transforms itself into action. The Peña administration increasingly looks much more like a puppet regime propped up by the US government than a democratic administration accountable to its people. The US public in general, and particularly those with strong ties to Mexico and Latin America, should not tolerate the use of their tax dollars to dismantle Mexico’s economic and political system, spreading violence and social discontent throughout North America. It is time for their voices of solidarity with the Mexican people to be heard in Washington. John M. AckermanTwitterJohn M. Ackerman (www.johnackerman.blogspot.com) is a professor at the Institute for Legal Research of the National Autonomous University of Mexico (UNAM), editor-in-chief of The Mexican Law Review and a columnist at both Proceso magazine and La Jornada newspaper.